MARIUPOL, Ukraine — She is a tall, confident woman with piercing blue eyes and a big smile, and Halina Odnoroh has become a celebrity volunteer on Ukraine’s front lines outside the threatened city of Mariupol. A woman takes the lead defending her city against Russian-backed separatists. But her biggest enemies may be duplicitous oligarchs ostensibly fighting for the same cause. In the last three months of almost daily shelling, she dug trenches, evacuated civilians from Russian-backed rebel territories, organized street protests of thousands of people against rumored demilitarization of besieged Mariupol and provided soldiers manning artillery positions just about everything they could ask for. The map of her daily car trips covers the entire front, including mined roads and villages where Mariupol taxi drivers often refuse to go: Novoselovka, Mirnoye, Hranitnoye, Ihnatevka and especially the constantly shelled Shyrokyne. Kiev’s military men trust Odnoroh. 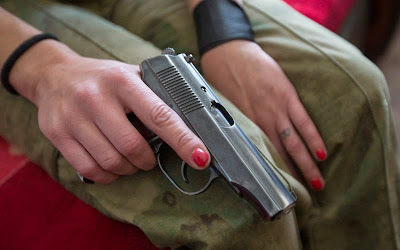 “She is the one who can make the difference,” Donbas Battalion Commander “Hal” told The Daily Beast, nodding toward Halina in the front seat as we drove. The battalion vehicle was approaching half-destroyed villages where people live in daily fear of new attacks. In these little corners of hell they make less than $100 a month and know they have no option for escape on the day the war comes to their doorstep. Can one Ukrainian woman change the situation in the region? “Our biggest concern is that the blow might come from within,” she says, cutting to the chase. “Separatists are among us in Mariupol. “The entirety of Mariupol, its two main factories and even the city mayor depend on one man, billionaire Rinat Akhmetov, who has business with Russia,” said Odnoroh, emotion rising in her voice. “That is the truth we need to discuss openly, if we are serious about changing Ukraine." Before the war, Odnoroh was a successful businesswoman managing a staff of dozens. In early April last year, when the first armed separatists threatened the peace in Mariupol and raised the Russian flag over the city hall, Odnoroh put camouflage on and turned herself into a leader of volunteers, spending her own savings on the Ukrainian Army’s soldiers and their needs. The owner of Metinvest and DTEK, Rinat Akhmetov, the richest man in Ukraine and the employer of about 280,000 people, was not so quick off the mark. He waited for another month to issue a statement rejecting separatism. At that point last May it was his workers who helped to take the city back form the separatists. But Akhmetov is widely criticized for waiting far too long and not helping Ukrainian law enforcement to stop separatism in the Donetsk and Luhansk regions, where the billionaire owns dozens of businesses. At the time, a year ago, separatists numbered a few score, not a few thousands as they do today. Odnoroh does not look on the human impact of this fight from a mansion or a limousine; she sees it in the trenches and in the hospitals. When she talked to The Daily Beast she had just spent a heartbreaking night with 26-year-old Alexander Sotnik, watching him die from his wounds as doctors proved helpless to save him. This month Ukraine demanded Russia pay $350 billion in compensation “for aggression,” but the Kremlin continued to deny Russia’s military involvement in Ukraine’s conflict. On Thursday, Mariupol residents could hear shooting on the outskirts of the city in the middle of the day. The Ukrainian militia battalion Azov reported persistent attacks the night before. Ukraine’s President Petro Poroshenko said on Wednesday that he did not trust Moscow: Kiev “must be ready for attack,” Poroshenko said. “Even if we wanted to, we would not do that,” said Basurin. The war in Ukraine has caused painful losses in both countries. This month the Russian opposition People’s Freedom Party, whose slogan is “For Russia Without Lawlessness and Corruption,” presented a report by the murdered political leader Boris Nemtsov. Nemtsov did not have time to finish the report before he was gunned down just outside the Kremlin walls, but his friends completed it for him. Since last April, 220 Russian soldiers have died in Ukraine, the report said. To speak the truth and demonstrate the people’s will to Ukrainian authorities and billionaire Akhmetov, Odnoroh and other civic leaders recently staged a rally of over 2,000 activists in Mariupol to protest the demilitarization (which could be tantamount to surrender) of the strategic village, Shyrokyne. “People like Halina feel strongly patriotic,” Mariupol Mayor Yuri Khotlubey told The Daily Beast in an exclusive interview. Did the mayor think the billionaire Akhmetov was such a real patriot? The mayor was reluctant to give a definite answer. “A patriot or not a patriot, this is all less important than real actions,” he said.